Two weeks ago we introduced the Eiffel-Kubo in Malaybalay. Before we sit down, I’d like to show you how to reach the Eiffel-Kubo. 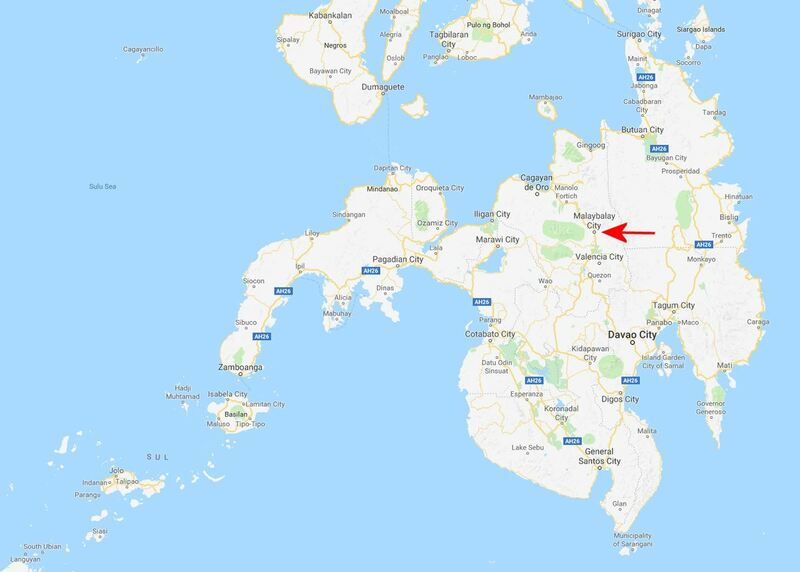 The restaurant can be found almost in the center of Mindanao island in the south of the Philippines. The city of Malaybalay is the capital of Bukidnon. This province is within the safe part of Mindanao! From Cagayan de Oro it is a 2 to 3 hours road trip up to Malaybalay. Currently you may encounter heavy road works. From Davao City on the really scenic highway you need about 5 hours to Malaybalay. Bukidnon is the farmland of the southern Philippines. Malaybalay’s elevation is about ‎622 m (2,041 ft). But the surrounding mountains climb up to almost 3,000 m (9,800 ft). Mount Kitanglad (2,938 meters), an extinct volcano, occupies the center and dominates the Bukidnon plateau. Mount Kalatungan (2,824 meters) and Mount Tankulan (1,678 meters) are the highest peaks in the southern part. Almost all vegetables you eat in the southern Philippines come from Bukidnon. The Eiffel-Kubo is situated in the centre of Malaybalay City. See our map in yesterday’s article. The secret of Eiffel-Kubo is the close encounter of two cultures. The Filipino culture represented by Angeli R. Echiverri. The French culture had been introduced by Guillaume (William) Kopp. Read more about the two in the presentation of the founders. When one speaks about Filipino cuisine, most people look at you as if you spoke about a circular square. Most Filipinos eat fast and silent because they are really hungry and do not think a moment of celebrating a good and beautiful plate. The French cuisine on the other hand likes refining tastes and celebrate a 5 to 7 courses dinner during 3 hours. 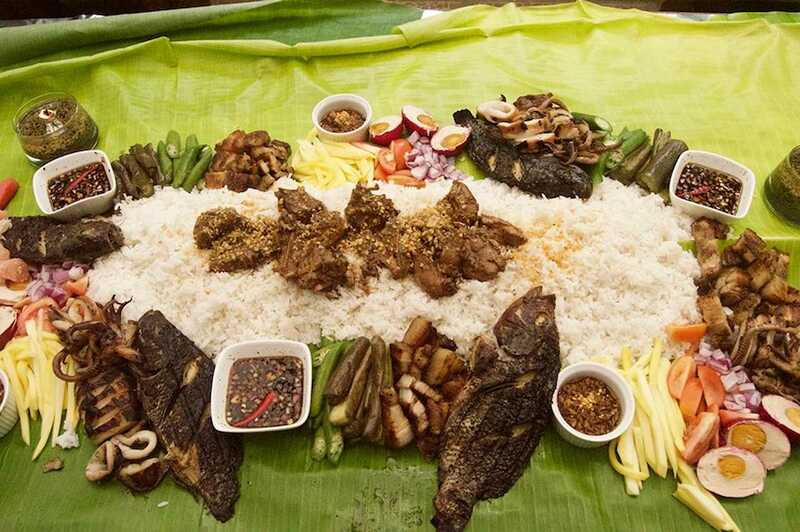 This photo of a typical rural Filipino food celebration (thanks to Eva for the picture) shows the most important incredients RICE, fish, pork, chicken and eggs. The vegetables are a very rare exception. Many of today’s Filipino dishes had been introduced by the Spanish colonisators such as Adobo, Lechon or Aroz caldo. The French cuisine is much more diversified. Every region in France has it’s own specialities. French food also depends on the seasons. Wikipedia has a good list of regional and seasonal French specialities. And here comes now the fusion of the two culinary cultures. 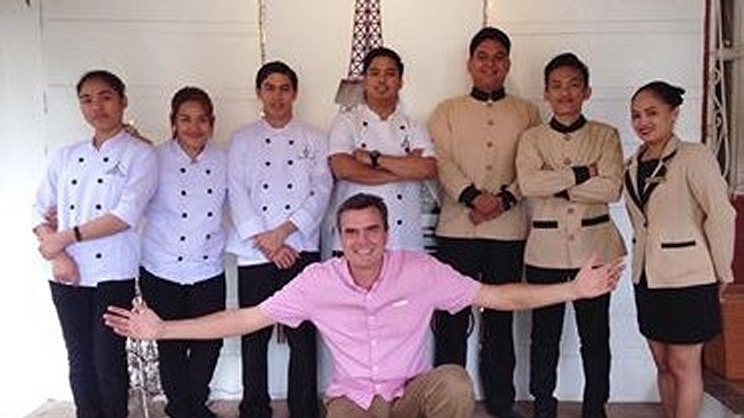 The kitchen brigade of the EIffel-Kubo, all Filipinos, refine local specialities and add the famous French touch. I started with a Creamy à la carte. 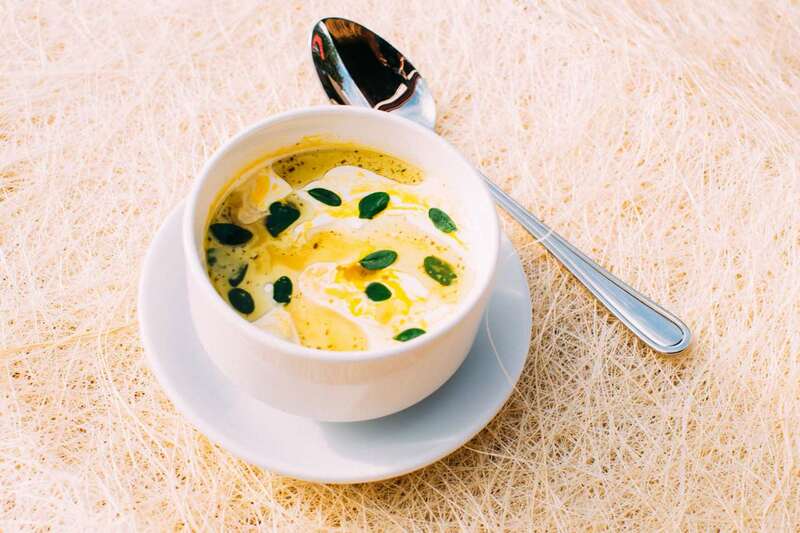 Pureed squash with coconut cream, topped with malunggay leaves. A glass of Chardonnay accompaned this tasty starter. 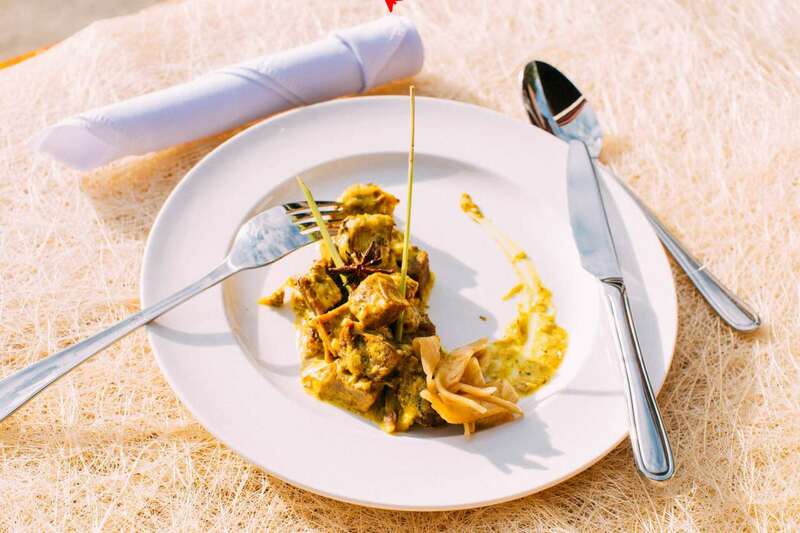 Above first course was followed by a Rendang Ala Pinoy – Beef brisket slowly simmered to tenderness in coconut milk, braised with the spices of “palapa”, the main ingredients of maranao cuisine. 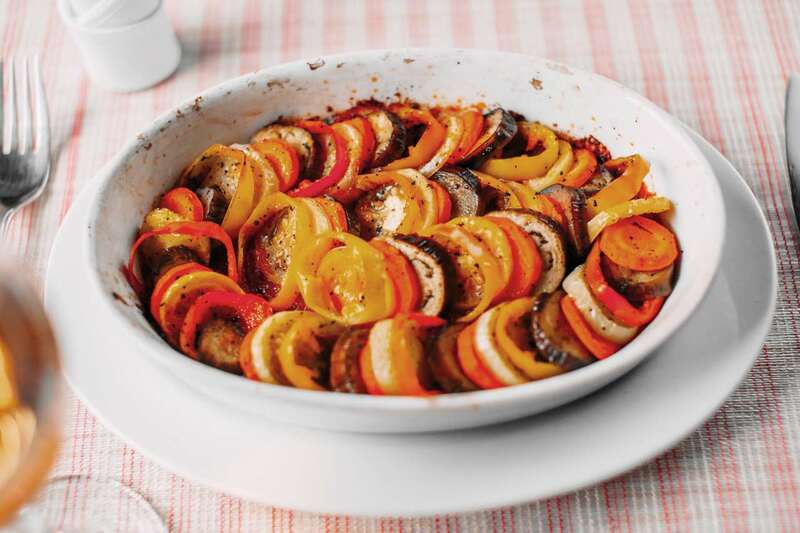 To give it a bit of French touch, I chose Ratatouille as side-dish. The two harmonized like lovers. A glass of Merlot helped to get master of this explosion of savors. 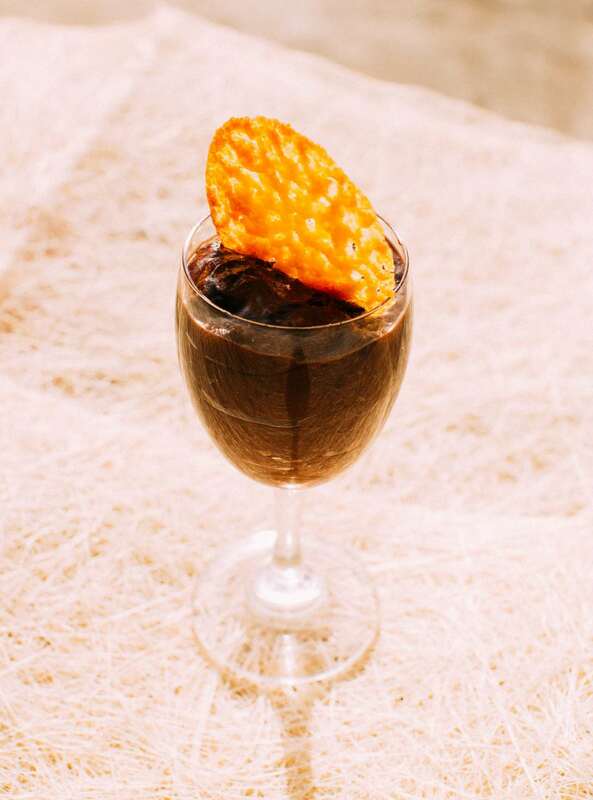 To finish this delicious meal I chose a Romance Chocolate Mousse a marriage of strong tablea cocoa with subtle brandy flavor crowned with candied orange peels. The encounter of local culture with French refinement made of each of these plates a unique experience. Me and my belly, we have been so happy after this wonderful dinner. We had the plaisure to meet the members of the kitchen crew. They received a standing ovation from the three of us. Sincere congratulations! The Eiffel-Kubo is much more than a restaurant – it is also a place of cultural encounters. Guillaume, the chairman and co-founder, showed us before and after dinner the current exhibition of local art-work. In the room below the restaurant, changing exhibitions, concerts and other events find their space. 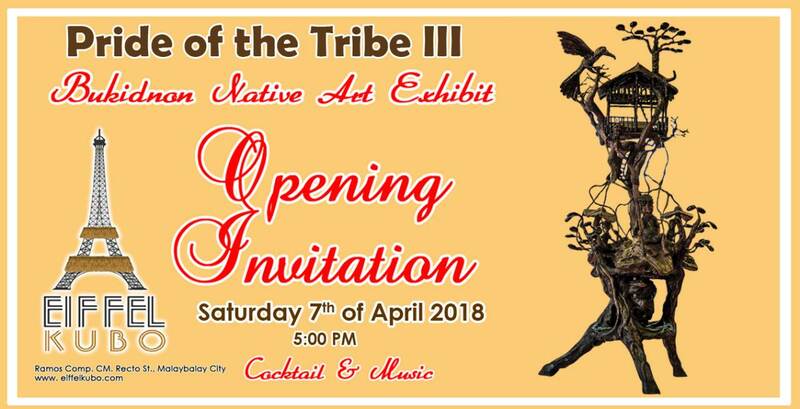 Recently the 3rd “Pride of the Tribe” exhibiton opened. We strongly recommend not to miss a visit before celebrating your dinner. We’ll go back to Eiffel-Kube that’s sure!